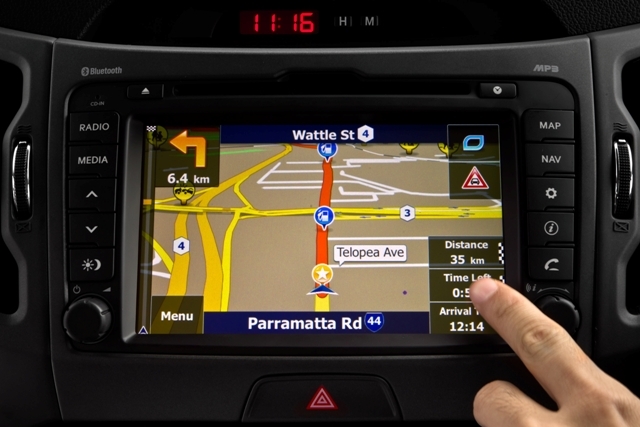 As Kia navigates towards its target of becoming the fastest growing mainstream brand in Australia, Sportage, Sorento and Optima buyers will have no trouble finding their way around with the arrival of Kia Motors Australia’s first satellite navigation system. The sophisticated LG touch-screen system has been developed and customised over the past 12 months to provide optimum performance for Australian users. It will come standard in Platinum grade vehicles in the three models, and is available as an option in SLi Sorento and Sportage. “We have promised Australian buyers the best in design, engineering and technology and this exciting new step is again proof that we make good on our promises,” Kia Motors Australia Chief Operating Officer, Tony Barlow, said. The LG head unit features a 6.5-inch full-colour touch screen in the Sorento and a 7-inch version in both Sportage and Optima. Mapping is from Navteq and the system will feature the outstanding SUNA live traffic notification software which will not only identify any traffic delays on the entered route but also offer the option of directing the driver around the traffic jam, accident or roadworks before putting them back on track to their destination. “The SUNA live traffic system gives a new relevance to satellite navigation for daily commuters who will obviously know their way to and from their regular destinations but now have the added peace of mind that there will be no unexpected surprises on the way,” Mr Barlow said. 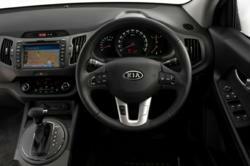 For the first time from any manufacturer in Australia Kia will also offer a service, branded Mapcare, which delivers a free map update at the 12- and 24-month anniversary of purchase. This will ensure that Kia owners are always on the pace in fast-changing urban environments. The system will also feature full integration with MP3 music streaming, Bluetooth phone connection including the ability to retain phonebooks for up to eight separate users and large-screen format display of the reversing camera. For the Platinum models the inclusion of the satellite navigation unit brings a $990 price premium taking the Sportage to $37,710 for the petrol and $40,710 for the award winning 2.0R diesel. Sorento will be $50,180 while Optima remains sensational value at $37,980. The SLi option in Sorento and Sportage is $1500. Sorento and Sportage satellite navigation will be in showrooms from March 17 while Optima is expected to be available from mid-year.